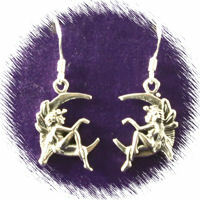 These earrings are an unusual design, a sterling silver fairy sitting on moon. Each fairy is 30mm wide and has a 38mm drop. They just hook through the ear and are very comfortable to wear.